The holidays are here! Are you ready? I would like to think that I am…but there is always A LOT to get done! Every holiday season, my husband and I have a list of things we love to do! 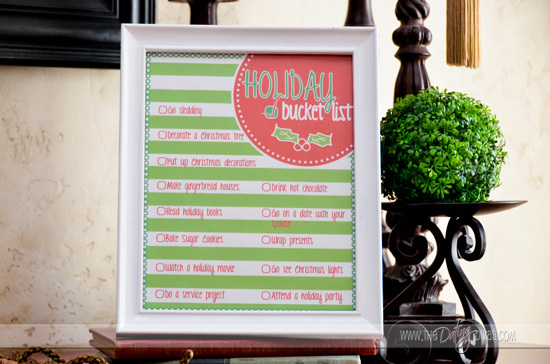 The oh-so amazing Aileen from Lil’ Buckaroo Designs created the darling printable, “Holiday Bucket List” using our list. Aileen can take anything ordinary and make it extra-ordinary. Thanks Aileen! So, there you have it! Print this quick and easy holiday bucket list for you and your spouse! It is filled with fun things to add to any holiday season! This list features everything from going sledding to using your favorite candy to decorate gingerbread houses. Print your Holiday Bucket List here! What are some of your holiday bucket list items?